I needed to change my room because the AC and the internet were not working properly they moved very fast and found me a new room. The AC units did not work that well on the higher settings. This hotel was clean & quiet and the studios were well equiped with everything we needed. Washer & dryers need maintenance. The outside of the hotel looked spectacular. The inside was not so clean. As you walked down the main hallway to the elevator, there were two commercial drying machines blowing air onto the pulled back molding around the baseboards. That was running from Friday through Monday. The elevator smelled like pasta. There was no hot water coming out of the shower on Saturday morning and there were burned cigarette holes on the bedspreads. The pet-friendly Extended Stay Deluxe Maitland is located off of Interstate 4 and comprises 134 suites designed for the extended stay business traveler or families on vacation. Items included with the room rate are a continental breakfast on weekdays, local telephone calls and parking. Area landmarks and attractions include numerous golf courses, Walt Disney World, Universal Studios, Sea World, the Wet 'n Wild water park, Gatorland, the Orange County Convention Center, the tourist strip along International Boulevard, the Florida Citrus Bowl, Amway Arena, home of the Orlando Magic basketball team and shopping at the Prime Outlet Shopping Mall, Fashion Square Mall and the Florida Mall. All the suites have a kitchen with a stovetop, full-size refrigerator with icemaker, dishwasher, dining cookware and utensils, iron and full size ironing board, television with cable news and movie channels, workspace with computer dataport and telephone with voicemail. There is a one-time $4.99 charge for wireless Internet. This hotel has an outdoor swimming pool and provides a complimentary continental breakfast on weekday mornings. Restaurants nearby include an Applebees, Bahama Breeze, an Olive Garden and a Red Lobster. The reception office is open from 7am until 11pm daily and can assist with copy and fax needs and has information on the Orlando events and attractions. Other amenities include a document printing station, guest laundry and vending machines. Housekeeping services are limited but you can buy additional cleaning. 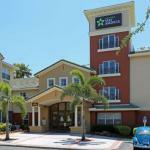 Travelers to Orlando who stayed at this Extended Stay said it was a great deal. The suites were cozy, comfortable and very clean. Families said the prices here were much lower than nearby hotels and they had the advantage here of producing some home-cooked meals and saving on restaurant expense. Many first time visitors to an Extended Stay property said it will not be their last stay. Business clients said it was worth the drive to downtown Orlando to enjoy the comfort of a spacious suite with the comforts of home.